Why Are Your Faucets Dripping? The water faucets that are featured in your home are pretty basic devices that normally don’t malfunction in any way very often. However, it is likely that some of eth mechanisms within your faucet will begin to age over time and the results is a leaky or dripping faucet that not only gets on your nerves, but also costs you more on utility bills. 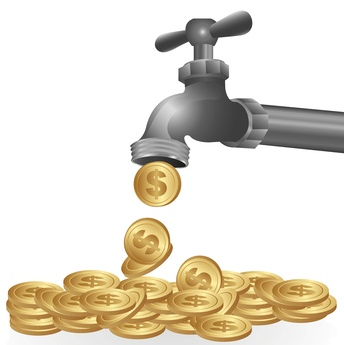 The cause of your leaking faucet is what results in either an intermittent dripping faucet or a constant dripping faucet. If notice that you have a leaking or dripping faucet, it is important to call on a professional plumber right away to correct the issue. In many instances, eroding connections can be the problem leading to the dripping of water from your faucet. Does Your Faucet Still Have Washer? Many old faucets still have a washer mechanism inside that is often the problem causing the dripping. However, new faucets that don’t feature washes can still have other issues. The center cartridge is often what is most susceptible to wear and tear over time and high water pressure only combines to cause more issues. If you are not sure what the cause of your dripping sink is, you should turn to a reliable plumbing professional to get the job done right. Diagnosing the cause of your dripping faucet is just the first step in fixing it correctly. Even new faucets can drip or leak due to defective components or connections. This is not normally a common occurrence, but it has been seen before. This means that if you have a new sink that is dripping, you should call on a professional plumber to inspect the components and connections of your faucet to ensure that they are not defective. If you have any defective parts it is important to address these issues right away. Many people assume that a leaky faucet is not a big deal and simply avoid addressing this issue for long periods of time. However, it is never a good idea to forget about dripping faucets in your home. The issue causing the drip will only worsen with time and cause more extensive damage. If you want the cheapest and easiest fix it is a good idea to call a professional plumber right away to fix your dripping faucet. http://knoxvilleplumbingllc.com/wp-content/uploads/2014/09/Screen-Shot-2014-09-29-at-12.34.15-PM.png 345 344 Knoxville Plumber http://knoxvilleplumbingllc.com/wp-content/uploads/2016/09/Website-Logo-KNoxville-Plumbing-2.png Knoxville Plumber2014-05-10 16:32:272014-09-29 16:36:28Why Are Your Faucets Dripping? How to Prevent a Plumbing Emergency - Tips To Do Before Selling Your House - When Remodeling, Do I Need a Plumber - Turn Your Bathroom Into A Spa - How Your Trees Are Affecting Your Plumbing - 41 Facts About Knoxville That You Probably Didn’t Know - Why Is It Taking So Long For The Water In My Home To Heat Up - Before You Deck the Halls... Have You Considered Your Plumbing? - The Holidays Are Coming Have Your Plumbing Ready! - 4 Crucial Plumbing Fixes You Should Complete Before Fall - Live Healthier With A Water Filter - Knoxville Plumbing Hosting Financial Peace University - Why Should You Give Hydrojetting a Try? - Spring Cleaning? Don't Forget Your Plumbing System! - How Do The Trees In Your Yard Effect Your Plumbing? - Hygiene Tips For Your Drains - How To Get Your Water Heater Ready For Spring - First Time Experiencing a Plumbing Emergency? - How to Handle a Slab Leak in Your Home? - Water Heaters Are Changing Forever in April 2015! - 5 Common Plumbing Mistakes made by Home Owners - These Famous People Were Once Plumbers and the List Will Surprise You! - 5 Incredible Ways Plumbing Changed The World — And Your Life - Save Money on your Washing Machine with These Simple Tips - Congrats to the Winner of the Knoxville Plumbing Tagline Competition! - Save Money on your Washing Machine with These Simple Tips - Protect Your Plumbing During Cold Snaps - Dealing with Sewer Stoppages in Knoxville, TN - Why Is My Water Heater Leaking? - How To React To a Plumbing Emergency - How Different Is A Tankless Water Heater From A Tank Water Heater? - Signs That Your Home Needs to be Repiped - Signs That Your Water Heater Needs Maintenance - Finding The Right Plumber For Me - Knoxville frozen pipes, burst repair prevention - Clean Your Drains the Safe Way! - Why Is My Water Pressure So Low? - Why Is My Garbage Disposal Not Working? - Does Your Home Need To Be Repiped? - Should I Have A Plumbing Inspection Done In My New Home - How Often Should I Have My Water Heater Checked Out - How Can I Keep My Drains From Clogging? - Use Chemical Drain Cleaners, Yes or No? - Why Take Advantage of Summer Drain Cleaning? - Why Are Your Faucets Dripping? - Why Install a Water Softener? - The Impact of Regular Drain Cleaning on Your Monthly Bills - Health Benefits Possible Through the Installation of a Water Filtration System in Your Home - Do You Need a Garbage Disposal? - How to Lower Energy Consumption in Your Home - How You Should Handle a Plumbing Emergency in Knoxville - How To Clean A Toilet - Will A Garbage Disposal Be A Benefit To Me? - Should I Get My Water Heater Checked More Often? - Some Homes In Knoxville Needs to be Repiped... Is Your Home One? - I Only Have a Home Project, Should I Hire A Plumber? - Should My New Home Have a Plumbing Inspection?